Some of you will know that I have been developing (for the past 2 or more years!) some fast multi-threaded Excel functions using the XLL C++ interface. After climbing this rather steep learning curve I am now very close to the final release of these functions. New calculation methods and modes give you greater control of calculation. Superfast memory lookup and Compare Lists functions make handling large data volumes easier. You can eliminate many SUMPRODUCT and array formula bottlenecks with SpeedTools FILTER.IFS. So download SpeedTools Beta 3 and tell me what you think! 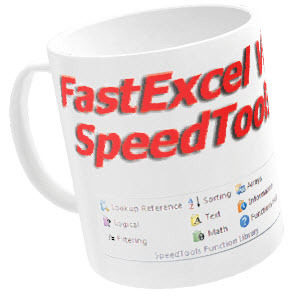 The best 20 Beta test feedback reports received by the end of March will get their own exclusive SpeedTools coffee mug, (and a free license of course!). Excel 2003 users get a toolbar to choose functions and launch the Function Wizard, and Excel 2007 and later users get 2 additional groups on the Formulas tab. You will find more information on my website and blog, including some performance comparisons with the built-in Excel functions. construct. Two VLOOKUPs in the same formula is terribly inefficient, so this new worksheet function is welcome. Or is it. I read this over at StackOverflow. It nearly makes me weep. I can think of no better way to get incorrect results than by wrapping every formula in IFERROR. It got me thinking about IFERROR in general, so I went and read about at office.microsoft.com. Here are the examples they give. Microsoft’s method is on the left and mine is on the right. My formula is =IF(E3<>0,D3/E3,0). Microsoft’s example totally masks the fact that there’s an error in the first line. They’re trying to avoid a divide by zero error, but they’re using a sledge hammer on a push pin. If they want to catch more errors than just #DIV/0!, they should test for them explicitly. As long as I’m writing about errors, another error handling construct that I dislike is this one. I don’t like this because ISERROR will detect any kind of error when the only one that should be detected is NA. If there’s a #NUM! error in there, you’ll get the result “Not Found”, which is technically true but hardly helpful and sometimes damaging. I’d like to have some guidelines about error checking in formulas. I’m the wrong guy to write these guidelines, but I’ll get the ball rolling. I’m sure you guys can poke some serious holes in that list, so please do. I guess my point is that errors are good. When you see an error returned in Excel, you know you made a mistake and you can fix it. If you don’t see it, you may not know and you may not fix it. Some errors are predictable and unavoidable, so we use the tools we have to deal with those errors in a responsible manner.